Discover the beauty of Halong Bay with Calypso Cruiser and you will surely not be disappointed. The two-day tour will take you through the most outstanding scenes of the Bay including caves, islands and fishing areas, etc. We also offer you a wide range of Vietnamese seafood dishes which are favoured by most international visitors. 08:00 – 08:30 Optional pick-up at hotel in Hanoi Old Quarter and start the 3 hour-and-a-half drive to Hong Gai Tourist Wharf, check in Oriental Sails JSC’s private waiting hall - The OS Lounge. 12:15 – 12:45 Embark on Calypso Cruiser by transfer boat. Listen to cruise briefing and receive room key. 13:00 – 15:30 Savor a delectable lunch as Calypso Cruiser further along the limestone islands of Bai Tu Long Bay, heading to Vung Vieng fishing village – one of the largest fishing villages in Halong Bay to see the life of local fishermen. 17:30 – 18:00 Return to Calypso Cruiser and have bath then relax as the sun starts to set. Enjoy the Happy Hour at the bar and on the sun deck while cooking demonstration is organizing. My trip on Calypso Cruise was awesome. A fun group of travelerss, but the best part was the crew. The crew were attentive, thoughtful and friendly. Thank our guide Tham was a joy. She always had a smile or a joke and a laugh. This helped set the tone for all on board. Had a fantastic cruise on calypso cruiser for 2 days and 1 night to Ha Long Bay. The visits and the meals were great, rooms very clean and all the staff, especially our tour guide, Tham, were so friendly and helpful. Tham spoke excellent English and was knowledgeable and informative. 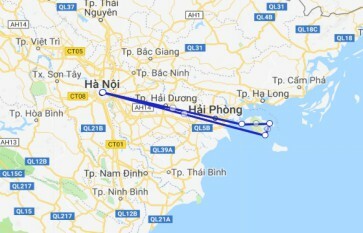 I would definitely recommend this cruise if visiting Hanoi. The Calypso Cruiser is so comfortable and luxurious. The food is 5 star without a doubt. Staff were super friendly and able to help in any way possible. Beds were super comfy. Activities and facilities on the cruise were A1. We only had one night - wished we had more time.